Missing in action (MIA) refers to a soldier who is reported to have gone missing during active service. The soldier may have been killed, injured, captured or deserted. It is not known what happened to them. If they are dead, neither their body nor grave can be found or identified. Going missing in action has been a risk for people in armed forces for as long as there has been war. According to official US Department of Army and Department of Navy casualty records, submitted to Congress in 1946 and updated in 1953, the combined possible total of missing service personnel worldwide is closer to approximately 6600 and probably considerably fewer. Since DPAA alone designates such WWII personnel as the crew of the USS Arizona and most of that of USS Oklahoma as both "missing" and "unaccounted-for" it is possible that DPAA records keeping may be somewhat idiosyncratic. Total of working number of MIA US Servicemen:7,662. ↑ Department of Defense map of North Korea with estimated loss concentrations." dpaa.mil. Retrieved: December 17, 2015. 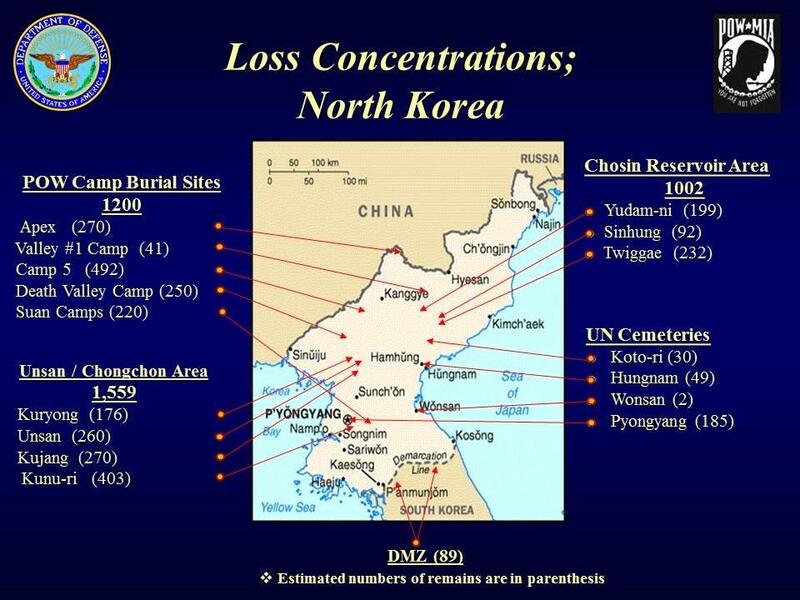 ↑ Department of Defense map of North Korea with estimated loss concentrations." dpaa. mil. March 20,2017. Retrieved March 28, 2017. ↑ "Defense POW/MIA Accounting Agency > Our Missing > Past Conflicts". www.dpaa.mil. Retrieved April 11, 2019. ↑ As of April 8,2019 PMKOR gives total as 7,662-the lower Number "Reflects actual number still unaccounted-for. PMKOR database count is slightly higher due to several entries pending administrative review. DPAA.mil"
This page was last changed on 11 April 2019, at 20:07.